Also serving communities of Hazel Park. There are 55 Assisted Living Facilities in the Royal Oak area, with 5 in Royal Oak and 50 nearby. The average cost of assisted living in Royal Oak is $6,450 per month. This is higher than the national median of $3,346. Cheaper nearby regions include Southfield with an average starting cost of $2,336. To help you with your search, browse the 256 reviews below for assisted living facilities in Royal Oak. On average, consumers rate assisted living in Royal Oak 4.7 out of 5 stars. Better rated regions include Farmington with an average rating of 5.0 out of 5 stars. Caring.com has helped thousands of families find high-quality senior care. To speak with one of our Family Advisors about assisted living options and costs in Royal Oak, call (855) 863-8283. Royal Oak is called "The City of Trees" because of its multitude of tree varieties that have been preserved and grown throughout the town since 1938. Royal Oak is a quiet suburb of Detroit with a senior population of 13.5 percent, where seniors can choose from five assisted living facilities to help with laundry and housekeeping, personal care, and medication administration - as well as providing a safe and secure environment. The Michigan Adult Foster Care and Homes for the Aged Licensing Division regulates assisted living facilities. The cost of living in Royal Oak is 5 percent lower than the national average, making it one of the more affordable places for seniors to live. The state of Michigan does not tax social security checks, which means seniors can enjoy having a little more money in their budget. Royal Oak has a lower crime rate than 60 percent of cities in the United States. A senior's chance of becoming a victim of violent crime here is only 1 in 808, compared to 1 in 218 for Michigan overall. The rate of property crime in Royal Oak is barely over half the state median. The City of Royal Oak provides transportation to residents who are aged 60 or over. Drivers provide a door-to-door service to help seniors attend medical appointments or get to where they need to go. The Royal Oak area is home to world-class medical facilities, including Beaumont Hospital, in the event of medical emergencies or illness. Royal Oak has an array of community resources for seniors, including Adjacent Generational Exchange (AGE), an organization that encourages volunteers to assist frail elderly people by sharing their skills, hobbies, and crafts, as well as two senior centers. Assisted Living costs in Royal Oak start around $6,450 per month on average, while the nationwide average cost of assisted living is $4,000 per month, according to the latest figures from Genworth’s Cost of Care Survey. It’s important to note that assisted living rates in Royal Oak and the surrounding suburbs can vary widely based on factors such as location, the level of care needed, apartment size and the types of amenities offered at each community. 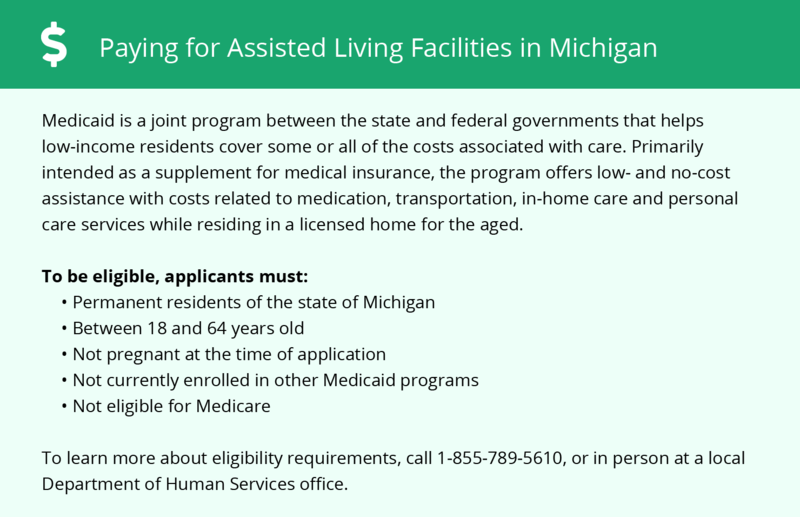 In Michigan, lower-income seniors can use Medicaid to pay for assisted living. 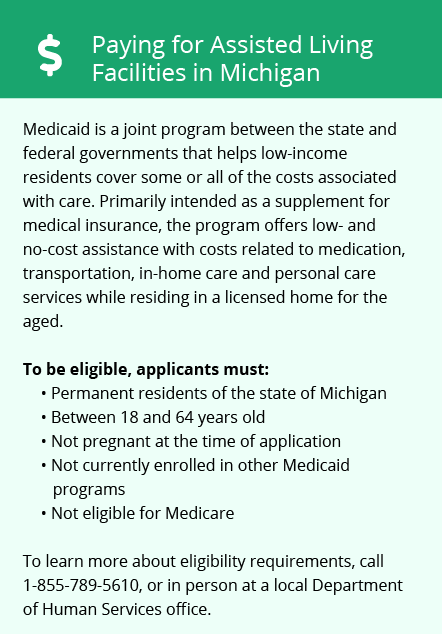 Michigan assesses seniors' eligibility for Medicaid on an individual basis, taking into account their income, care and medical expenses, and their cost of living. However, Michigan, unfortunately, does not offer any non-Medicaid financial assistance programs to help seniors meet the costs of assisted living. To see a list of free assisted living resources in Royal Oak, please visit our Assisted Living in Michigan page. Royal Oak-area assisted living communities must adhere to the comprehensive set of state laws and regulations that all assisted living communities in Michigan are required to follow. Visit our Assisted Living in Michigan page for more information about these laws.